was part of Stow, before Maynard became a town. 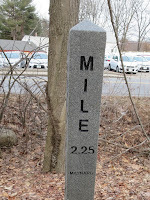 Progress on the Maynard & Acton section of the Assabet River Rail Trail has reached the point where it is easier to write about what is not completed versus progress of the trail as a whole. The original plan called for ARRT’s completion in May. Construction will now continue into July, with a ribbon-cutting ceremony to be scheduled soon after. Nice to think that people will be able to walk or ride to the event. The major delay was the discovery of serious soil pollution behind the automobile and motorcycle shops just north of Concord Street. This was old dumping, from businesses long gone. Remediating the problem required an additional $600,000 of state and federal funding to remove hundreds of cubic yards of contaminated soil and water. There have also been lesser delays in Maynard and Acton, all soon to be history. Even with a few sections incomplete, the trail is getting heavy use. In fact, the combination of dog walkers, stroller pushers, walkers, runners, skateboarders and recreational bicyclists so fill the pavement that serious cyclists – the Spandex-clad crew that wants to speed along at 20 miles per hour – are perforce finding that they are at such risk of crashing into other users that they must abandon the trail. Not a surprise. Paved trails in suburban areas always draw so much usage that roadies end up back on the roads again. Ironic, given that these are often the people who put in long years of volunteer work to create the trails in the first place. On the plus side for cyclists the trail already offers a safer commute to the Acton train station compared to Route 27. Mileage markers are in place. 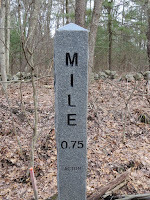 Maynard’s start at the Stow/Maynard border (White Pond Road), at 0.0 miles. Touch the stones for a surprise – granite, but clear-coated with some type of rubbery-feeling substance. 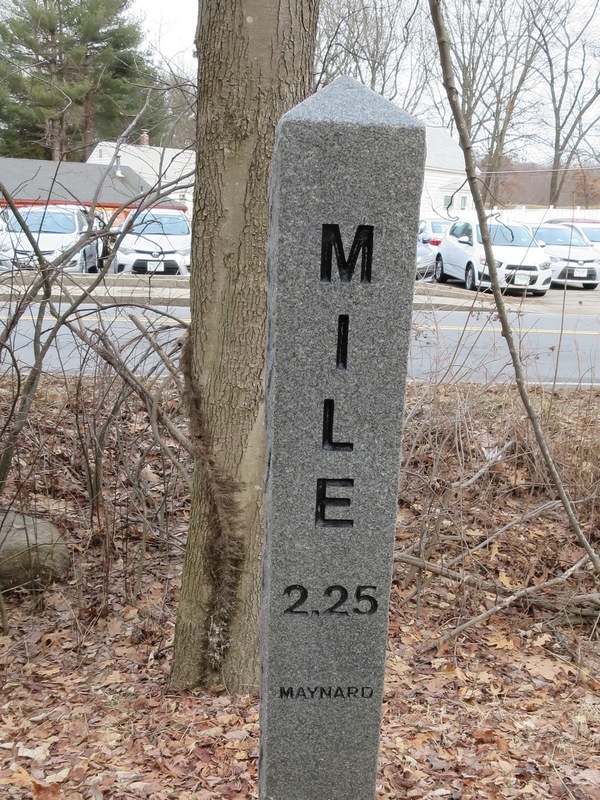 For the numerically compulsive there are markers every quarter mile, so that the last in Maynard reads 2.25. 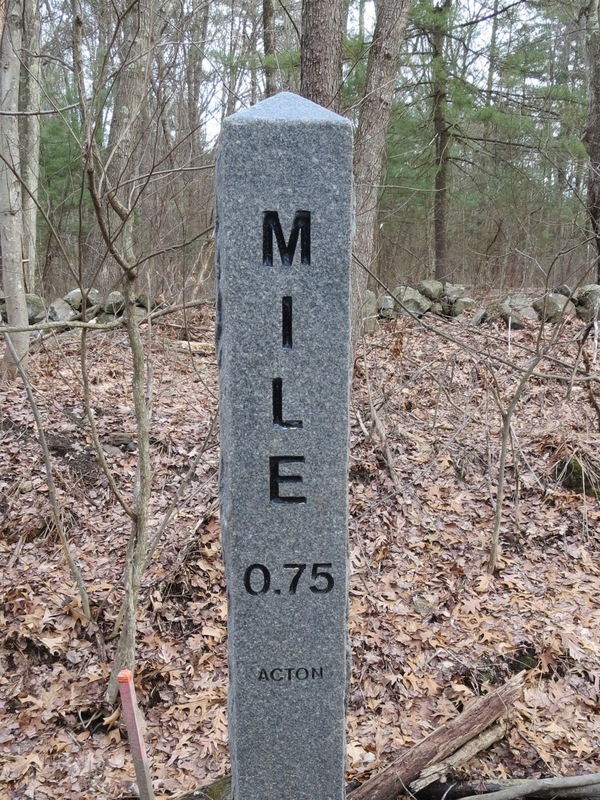 And then, 100 yards farther is the Maynard/Acton border with a 0.0 stone to indicate the start of the Acton section. The northernmost Acton stone indicates 1.0 miles. Overall length 3.4 miles. Completion of the trail in Acton and Maynard, added to the Marlborough and Hudson work finished years ago, leaves Stow unfinished as a future project with no date set yet. Each town has installed plaques to indicate historic sites. Acton: site of a Morocco leather factory. Maynard: Marble family homestead (very badly overgrown) and the mill complex. In Maynard, choices of images and wording courtesy of the Maynard Historical Commission. Road crossing signage and strobe lights have been installed at major roads. Toward the west end – all completed – Ice House Landing has a parking lot and a kayak launch dock. On weekends the lot is often full because of the many people who want to use the trail or the river. In Acton there are parking lots at the end of Sylvia Street and the north end, near the train station. There is a common misconception that ARRT will in time connect to the Bruce Freedman Trail, which is currently wending its way south, through Acton and toward Concord. Not true. Each project follows separate former railroad right-of-way routes, but the only possible non-road connection between the two is the still-active railroad from Boston to Fitchburg. On-road connection (School Street and Laws Brook Road) will work as an alternative. Final landscaping is a work in progress. Tree and shrub planting has been nearly completed, but a few of last year's plantings did not survive the winter and will be replaced. Going forward, the towns will have to decide what level of maintenance is needed, whether to snowplow in winter, and also whether to install amenities such as benches and trash receptacles that were not part of the original project. Under maybe, the City of Marlborough teamed up with Zagster, Inc., to offer a bike-share program to city residents, employees and visitors. The two-year pilot started with 30 bikes across five stations, including two on or near the Marlborough portion of the Assabet River Rail Trail. Maynard is exploring installing two bike-share stations, one of which to be on the Trail.